Lassie! Lassie! You've come home," shouted out Timmy's mom, Mrs.Martin. "I knew you would, girl, I knew you would!" 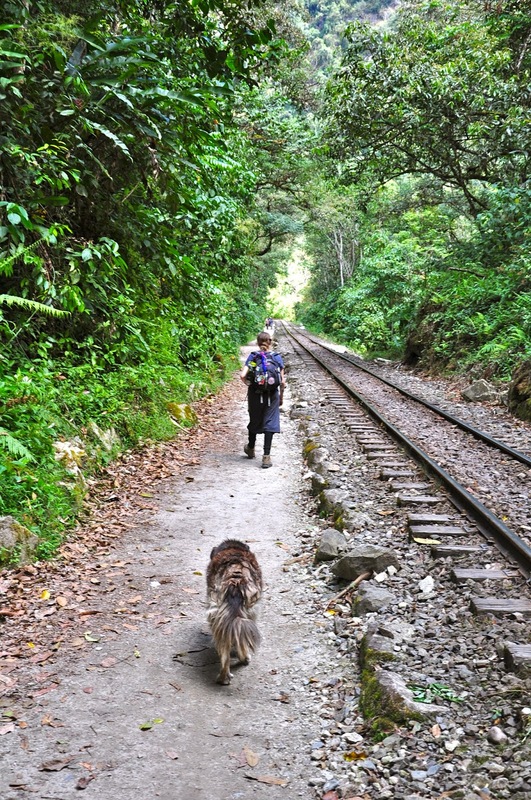 Lassie was trotting along the railroad tracks and glimpsing Mrs. Martin, she excitedly ran right up to her. The old girl looked exhausted and emaciated, her hair and coat filthy and matted. "Poor girl, what you must been through!" cried Mrs. Martin. "We will take care of you forever and forever more, Lassie." "With all due respect, Mrs. M," said Lassie, "all I came back for was my toothbrush. I'm hooked up with an ashram in the next county." "Oh, and tell Timmy everything has been swell, but frankly, I liked Jeff better." 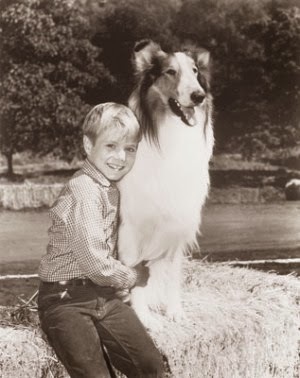 You most likely don't remember, but Lassie enchanted us on the small screen all through the fifties and then some, living with a number of masters and sometimes living without them because she was a lot smarter than you or I. This is my Friday Fictioneers contribution based on the picture prompt above, and below are Jeff (the first owner) and Timmy (the second) in their heyday. 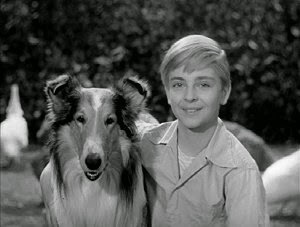 Maybe one day Lassie will return to Timmy because Timmy's now about 60 and Jeff, I'm afraid, has passed.Click here for more of our dog and pony show only without the pony as authored by our Fellow Fictioneers. "Hey Lassie! Here, girl, I've got your toothbrush! Vibrating too." Another "Perry" outstanding story. I do not know how Russell is going to beat this. Mike, Russell and I are in no way in a competition to beat each other... but NA, NA, NA,NA, NAH, Russell! Well, maybe a little. Thanks for writing. Great piece of memorabilia here. Love the ashram. Sounds as thought Lassie went over to the Beatles. I remember Lassie sitting there with her paw raised as the credits rolled and the music played. I also remember the Beatles first appearance on Ed Sullivan. Wow! That's sounding old. I think I must have seen them online. (Where's the "Click if you're a robot" button? Unfair! Protested by RFETR (Robots for the Ethical Treatment of Robots). Nice trip done a great memory lane. Who's fallen down the old well now? I loved the name Rudd Weatherwax, BTW. Thanks for the freaky flashback. I don't remember Jeff! But then, I didn't watch much TV, and my memory is crap. What did you say your name was??? Of course I remember Jeff and Timmy. Personally I liked Timmy better. Well maybe it was just that I liked his too perfect, white-bread parents. The last line made me laugh hard enough to fall off my chair and spill my coffee. Your script is just as excruciating as the originals were. Thanks, Perry. This is priceless, once I got to read your story, because I got so distracted by your "About me"... but when I stopped laughing, I finally got there. And I liked Jeff better, too. Perry certainly set the bar high this week. I should probably give up now and save the risk of embarrassment. It's a good thing I read this story first, because I thought it was Flipper in the picture. Boy, would I have looked dumb (or maybe dumber). White-bread parents? Good thing it wasn't set in the Ozarks or West Virginia, they might have been in-bred parents. Personally, I thought Timmy's mother was cute. Lassie never seemed very keen on her though. Probably some jealousy on the set. You know how those dog-stars can be. I think I preferred Jeff, but preferred Timmy's family with June Lockhart. What I mostly preferred, however, is that I was a kid then, which is what I should still be now, damn it! Thanks for writing, Alicia. Lassie was always very spiritual and committed. I hear she and June Lockhart joined the Weather Underground some years later. I cried through every Lassie movie and every TV episode. They were pretty heavy for little kids. I'm afraid we are old, Janet, though I've got a few on you. I remember Lassie's paw raised too although I honestly didn't remember that Timmy was adopted (I saw this episode years later). As for the Beatles,"Sorry, girls, he's married." Enough said. Yep, there's a nostalgia there that gets me too, especially when Lassie joined that ashram and began experimenting with drugs. Actually, the nostalgia of these old shows does make me sad, as I think about the performers no longer with us and/or aged (June Lockhart is about 90), and of course, how damn old I am! Scratch, Scratch. Lift leg, Lift Leg. Yes, it seems somebody fell down a well in every episode. You'd think they'd have learned; "look a well, let's play football next to it." I understand the name "Rudd Weatherwax" was a stage name. His real name was "Bruce Weatherwax." You're welcome for the freaky flashback. Lassie. Mr. Lassie. Pleased to meet you. I realize that some of our younger readers such as yourself might be mystified by all this. Tell you what, next time I'll write about something you'll recognize from your own generation --- Justin Bieber. I liked Jeff more because I thought Timmy was a bit too cloyingly cute, but I preferred June Lockhart as the mom. In-bred parents? Lassie jumping up on my leg? Thanks for spoiling our nostalgia, Russell! Not sure I was going for excruciating, but I'll take any compliment I can get. Yes, I though she was cute too, but I liked her better in Lost in Space and I was heartsick that she was then married to Zorro. And like you said, I heard Lassie had a terrible show business ego, constantly drugging the guest stars so she could secretly sniff their behinds. It's not Flipper? Damn, I thought Flipper was the one that Timmy and Jeff owned. Wasn't it Lassie that wound up in that can of tuna? Boy, am I confused! So funny, Perry. Of course, I remember Lassie. I can't imagine Lassie with matted fur. I can't say I knew his owner's names either. Lassie seems like the kind of dog who would play favorites. I love syrup especially with whipped cream and sprinkles. Going over to read your story now. You've probably only seen Lassie in reruns so of course you wouldn't know. I remember Lassie from when she first evolved from a wolf,so I remember her owners going way back. I remember watching it as a kid too and thinking "why does everybody have a phone you have to crank?" Sure was another world. Yes, I loved it too. Of course it was re-runs when we watched it. Later it came out on color but it wasn't near as good for some reason. Lassie had a lousy makeup artist in those years. This isn't my comment; it'sTracey's. Somehow I lost her original comment so I'm duplicating it here. I am a hell of a guy. I had a lot of trouble getting my karma started this morning. Must be that bad karma Lassie's been spreading around.